Since I have a talent for answering a simple question with a half hour discourse I explained the following…. I’ll give you an example. Some years ago I was lunching with a wonderful friend, the late Virginia Martini, in Santa Barbara the day before I left for a month and half in France. Virginia was a very worldly woman. Her first husband was Cary Grant. Her second husband was the Earl of Jersey. Her last husband was a Polish flier in WWII who escaped to England and flew with the RAF. Santa Barbara friends had the opportunity to meet many of Virgina’s friends from her past when they came to visit her in Santa Barbara. One of her house-guests who was widely entertained during her visit with Virginia & Florian was the duchess with a most colorful past, Margaret, duchess of Argyll. Virginia was an intimate friend of David Niven and Jai, the Maharaja of Jaipur, the great grandfather of the very young current Maharaja of Jaipur, was in love with her. 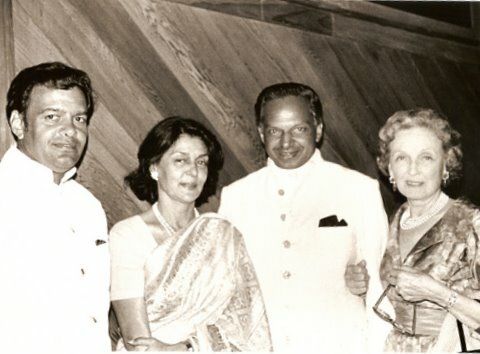 Virginia Martini with my guests for a Noche de Gala Fiesta party in 1970’s, Bubbles the maharaja of Jaipur, his brother Joey, Ayesha, the rajmata (queen mother) of Jaipur, widow of Bubbles’ father Jai. 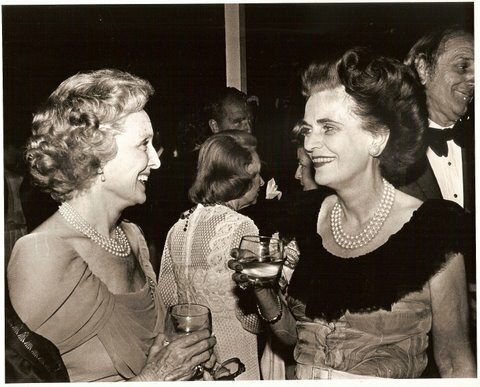 Virginia Martini with her houseguest Margaret, duchess of Argyll at a party in Santa Barbara in their honor. A simple question from Virginia “Are you set to go?” brought the explanation that I was except I’d just discovered that morning the clasp on my black leather handbag I always carry when traveling was broken and it was too late to have it repaired. But back to the handbag. Virginia had a vast array of the very finest leather bags, several with interior fittings for travel items. She insisted I take two and not as a loan but gift so I wouldn’t worry about damaging them. Virginia was at an age where home with Florian Martini and all her dogs and her friends was her life. No more fabulous travels. 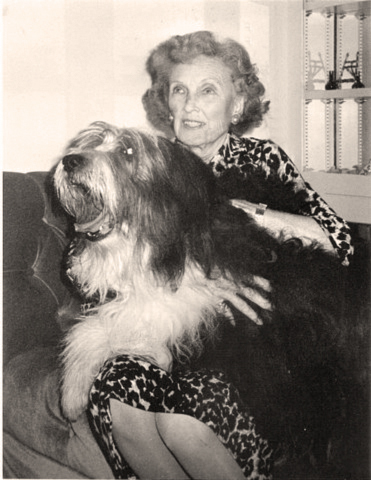 Virginia Martini with one of the many stray dogs and cats who shared her bedroom and bed in her last years. The bags were simple but superb quality.The detailing perfection. They weren’t covered with today’s LV’s, CC’s, GG’s etc. There was just a small gold monogram, a combination of VJ, her Countess of Jersey’s initials, topped by the coronet of an English countess, wife of an English earl. 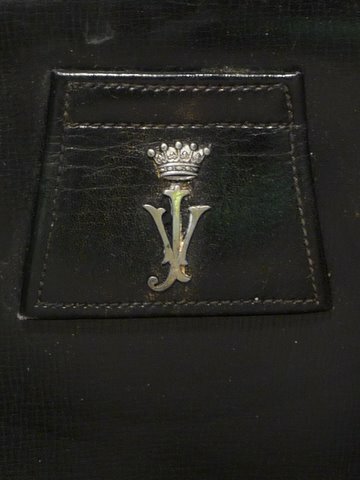 Here’s what this blog is all about, Virginia Martini’s initials and coronet on bag she had when she was the countess of Jersey that I took to Paris. Soooo I’m in Paris and I go to a marvelous stationery store where I have shopped for years. Where I have spent a great deal of money for years! And where I had always been treated exceedingly rudely by the woman who always waits on me. If they hadn’t carried such desirable merchandise I’d have walked out the first time and never returned. So there I am once again being treated most haughtily while I pick out an assortment of enchanting and excessively expensive place cards molded like rose petals. Something I would never buy today! And Virginia’s purse is casually sitting on the counter. I just happened to glance up at the very moment my tormentor spotted that tiny gold coronet. “C’est vous Madame?” she asked in the most surprised voice a whole octave higher than she had previously always used on me. I just smiled sweetly and enjoyed from that moment on being treated like a queen. Well at least a British countess! That was infuriating but with a mixture of supreme pleasure. And Virginia enjoyed it more than I when she heard the story upon my return. Here is Charlie Chaplin’s silent classic “City Lights” where Virigina Martini starred as the blind flower girl. know the shop. Miss you. Come back soon. PS Edmond has just joined your blog! I love it! Give him big hug for me. I, too, have a handbag given to me by Virginia (who became my godmother late in life – another story) which i treasure. It is black, made of antelope and i leant it to a film production about Hollywoodland where the purse had a “starring role” in the documentary! Will have to show it to you sometime., Bev.